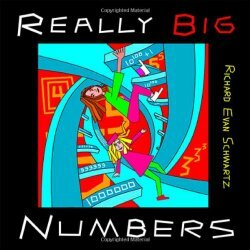 Archive for the ‘Math’ Category. The beautiful Pascal triangle has been around for many years. Can you say something new about it? Of course you can. Mathematicians always find new way to look at things. In 2012 RSI student, Kevin Garbe, did some new and cool research related to the triangle. 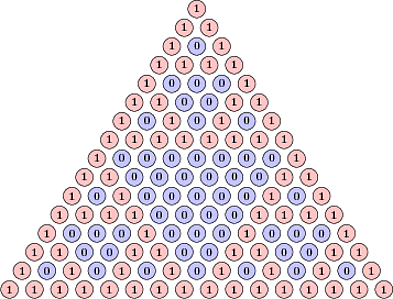 Consider Pascal’s triangle modulo 2, see picture which was copied from a stackexchange discussion. A consecutive block of m digits in one row of the triangle modulo 2 is called an m-block. If you search the triangle you will find that all possible binary strings of length 2 are m-blocks. Will this trend continue? Yes, you can find any possible string of length 3, but it stops there. The blocks you can find are called accessible blocks. So, which blocks of length 4 are not accessible? There are only two strings that are not accessible: 1101 and 1011. It is not surprising that they are reflections of each other. Pascal’s triangle respects mirror symmetry and the answer should be symmetric with respect to reflection. You can’t find these blocks on the picture, but how do we prove that they are not accessible, that is, that you can’t ever find them? The following amazing property of the triangle can help. We call a row odd/even, if it corresponds to binomial coefficients of n choose something, where n is an odd/even number. Every odd row has every digit doubled. Moreover, if we take odd rows and replace every double digit with its single self we get back Pascal’s triangle. Obviously the two strings 1101 and 1011 can’t be parts of odd rows. What about even rows? The even rows have a similar property: every even-indexed digit is a zero. If you remove these zeros you get back Pascal’s triangle. The two strings 1101 and 1011 can’t be part of even rows. Therefore, they are not accessible. The next question is to count the number of inaccessible blocks of a given length: a(n). This and much more was done by Kevin Garbe for his RSI 2012 project. (I was the head mentor of the math projects.) His paper is published on the arxiv. The answer to the question can be found by constructing recurrence relations for odd/even rows. It can be shown that a(2r) = 3a(r) + a(r+1) − 6 and a(2r+1) = 3a(r) + 2a(r+1) − 6. As a result the number of inaccessible blocks of length n is n2 − n + 2. I wonder if there exists a direct proof of this formula without considering odd and even rows separately. This RSI result was so pretty that it became a question at our entrance PRIMES test for the year 2013. In the test we changed the word accessible to admissible, so that it would be more difficult for applicants to find the research. Besides, Garbe’s paper wasn’t arxived yet. The pretty picture above is from the stackexchange, where one of our PRIMES applicants tried to solicit help in solving the test question. What a shame. Why are manhole covers round? The manhole covers are round because the manholes are round. Duh! But the cute mathematical answer is that the round shapes are better than many other shapes because a round cover can’t fall into a round hole. If we assume that the hole is the same shape as the cover but slightly smaller, then it is true that circular covers can’t fall into their holes. But there are many other shapes with this property. They are called the shapes of constant width. Given the width, the shape with the largest area is not surprisingly a circle. The shape with the smallest area and a given constant width is a Reuleaux Triangle. Here is how to draw a Reuleaux triangle. Draw three points that are equidistant from each other at distance d. Then draw three circles of radius d with the centers at given points. The Reuleaux triangle is the intersection of these three circles. Can we generalize this to 3d? What would be an analogue of a Reuleaux Triangle in 3d? Of course, it is a Reuleaux Tetrahedron: Take four points at the vertices of a regular tetrahedron; take a sphere at each vertex with the radius equal to the edge of the tetrahedron; intersect the four spheres. Is this a shape of the constant width? Many people mistakenly think that this is the case. Indeed, if you squeeze the Reuleaux tetrahedron between two planes, one of which touches a vertex and another touches the opposite face of the curvy tetrahedron, then the distance between them is equal to d: the radius of the circle. This might give you the impression that this distance is always d. Not so. If you squeeze the Reuleaux tetrahedron between two planes that touch the opposite curvy edges, the distance between these planes will be slightly more than d. To create a shape of constant width you need to shave off the edges a bit. Theoretically you can shave the same amount off every edge to get to a surface of constant width. But this is not the cool way to do it. The cool way is to shave a bit more but only from one edge of the pair of opposite edges. You can get two different figures this way: one that has three shaved edges forming a triangle, and the other, where three shaved edges share a vertex. These two bodies are called Meissner bodies and they are conjectured to be shapes of the constant width with the smallest volume. On the picture I have two copies of a pair of Meissner bodies. The two left ones have three edges that share a vertex shaved off. The very left shape gives a top view of this vertex and the solid next to it has its bottom with holes looking forward. The two shapes on the right show the second Meissner body in two different positions. I recently discovered a TED-Ed video about manhole covers. It falsely claims that the Reuleaux tetrahedron has constant width. I wrote to TED-Ed, to the author, and posted a comment on the discussion page. There was no reaction. They either should remove the video or have an errata page for it. Knowingly keeping a video with an error that is being viewed by thousands of people is irresponsible. 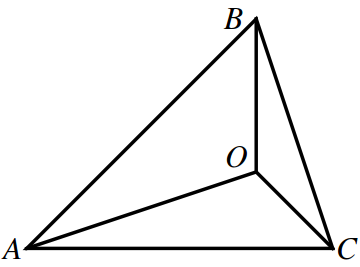 Consider a triangle with vertices A, B, and C. Let O be its orthocenter. Let’s connect O to the vertices. We get six lines: three sides of the triangle and three altitudes. These six lines are pair-wise orthogonal: AO ⊥ BC, BO ⊥ AC, and CO ⊥ AB. It is easy to see that A is the orthocenter of the triangle OBC, and so on: each vertex is the orthocenter of the triangle formed by the other three. We say that these four points form an orthocentric system. I heard a talk about this structure at the MOVES 2015 conference by Richard Guy. What I loved in his talk was his call to equality and against discrimination. The point O plays the same role as the other three points. It should be counted. Richard Guy suggested calling this system an orthogonal quadrangle. I am all for equality. This is not a triangle, this is a quadrangle! Let us start with regular (non-weighted) mediants. Suppose we have two fractions a/b and c/d, the mediant of these two numbers is the wrong way a child might sum these two fractions: (a+c)/(b+d). There is nothing wrong with this childish way of summing, it is just not a sum of two numbers, but rather an operation the result of which is called a mediant. One must be careful: the result doesn’t depend on the initial numbers chosen, but on their representations. The way to deal with this is to assume that a/b, c/d, and (a+c)/(b+d) are in their lowest terms. The numerical value of the mediant is always in between given numbers. This is probably why it is called a mediant. Suppose you start with two rational numbers 0/1 and 1/1, and insert a mediant between them. If you continue doing it recursively, you can reach any rational number between 0 and 1. This is a well-known property of the mediants. For example, after three rounds of inserting mediants into the initial sequence (0/1, 1/1), we get the sequence: 0/1, 1/4, 1/3, 2/5, 1/2, 3/5, 2/3, 3/4, 1/1. The mediants are easy to generalize if we assign weights to initial fractions. Suppose the first fraction has weight m and the second n, then their weighted mediant is (am+cn)/(bm+dn). The simplest generalization happens when the total weight, m+n is 3. In this case, given two rational numbers a/b and c/d, the left mediant is (2a+c)/(2b+d) and the right one is (a+2c)/(b+2d). Obviously the inequality property still holds. If a/b ≤ c/d, then a/b ≤ (2a+c)/(2b+d) ≤ (a+2c)/(b+2d) ≤ c/d. James Propp suggested the following question for our PRIMES project. Suppose the starting numbers are 0/1 and 1/1. If we recursively insert two weighted mediants in order between two numbers we will get a lot of numbers. For example, after two rounds of inserting weighted mediants into the initial sequence (0/1, 1/1), we get the sequence: 0/1, 1/5, 2/7, 1/3, 4/9, 5/9, 2/3, 5/7, 4/5, 1/1. It is easy to see that new fractions must have an odd denominator. Thus unlike the standard case, not every fraction will appear. The question is: will every rational number between 0 and 1, which in reduced form has an odd denominator appear? I started working on this project with Dhroova Aiylam when he was a high-school junior. We didn’t finish this project during the PRIMES program. But Dhroova finished another project I already wrote about: he analyzed the case of the standard mediants with any starting points. He showed that any rational number in between the starting points appears. Dhroova became an undergraduate student at MIT and we decided to come back to the initial PRIMES project of weighted mediants. In our paper Stern-Brocot Trees from Weighted Mediants we prove that indeed every fraction with an odd denominator between 0 and 1 appears during the recursive procedure. We also analyzed what happens if we start with any two rational numbers. You are given N coins such that two of them are fake and the other coins are genuine. Real coins weigh the same. Fake coins weigh the same and are lighter than real ones. You need to find both fake coins using a balance scale in the smallest number of weighings. It is easy to estimate the number of weighings from below using information theory. Given N coins you will have N choose 2 different answers. The number of possible answers has to be not more than 3w, where w is the number of weighings. This generates a trivial information-theoretic bound (ITB) on the number of coins that can be processed in a given number of weighings. Previous authors used computers to completely analyze small numbers of weighings: from 2 to 5. My colleagues from Russia, Konstantin Knop and Oleg Polubasov, performed some fantastic programming accompanied with some subtle heuristic and found optimal solutions for up to 10 weighings. For 11 and 12 weighings, the program is not efficient enough to find the optimal solutions: it found some solutions. Surprisingly, for up to 10 weighings, the optimal solutions match the information-theoretic bound (ITB). The results are in the table below. The first row represents the number of weighings w. The second row is the largest number of coins N for which a solution is found. The last row is the information-theoretic bound (ITB) we explained above. Their paper, Two counterfeit coins revisited, is available in Russian. Lucky for us, 70 of 73 pages are pseudo-code of solutions for which you do not need any Russian. You just need to understand the pseudo-code. Here is the explanation. => L means go to line L.
(a, b) means the fake coins are a and b. – means this branch is impossible and there is no output. => 23. sym indicates the symmetry of the weighing and its result, therefore the resulting go-to line, 23, is omitted as being equivalent to another line. – . sym means the output is symmetric to another one. The line numbers after => in line L are always 3L+1, 3L+2 and 3L+3. The sym symbol implies that line 3L+3 is omitted as a symmetric version of line 3L+2. 1. 1 v 3 : – , (1, 2), (3, 4). If you want to see an optimal solution for 10 weighings, look at the paper: the algorithm takes 36 pages.